Ennobled. Honestly, when I first heard about The SCAR Project from my friend Shelly while we were a pair of bald chicks hooked up to IVs in the chemo cocktail lounge, ennobled wasn’t the first word that popped into my head when I imagined a photographic exhibition of young women confronting breast cancer and baring their scars. Road-trip. That was my first thought. Shelly and I met in the chemo lounge and the only time we’d ever spent together up to that point was in the chemo cocktail lounge, sitting side by side in pale blue recliners, waging the ugliest war either of us had ever fought and neither of us were feeling ennobled quite yet. 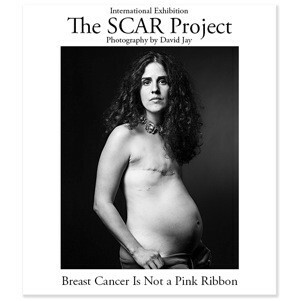 But I was feeling like a road-trip to the Big Apple to see The SCAR Project Exhibition (which I hadn’t even Googled because she said it was an awareness campaign I already felt pretty breast cancer aware) sounded like just the ticket. I wasn’t as breast cancer aware as I thought I was. I mean, I was aware of my breast cancer, my absolute reality of what surviving cancer, or at least fighting like hell to survive it, felt like, my scars. But then I saw Emily’s portrait at The SCAR Project Exhibition. My scars are similar to Emily’s, but mine tell a different story. At the time of my diagnosis I was a 42-year-old mother of three teens. I nursed them all as babies. In Emily’s portrait I saw a beautiful young mother-to-be confronting a completely different reality of surviving cancer than me. That quote from Carly Simon comes to mind when I think about standing in front of Emily’s picture, the first time I saw The SCAR Project. Especially, that word: ennobling. I was super fortunate to get to meet a couple of the SCAR girls that day. 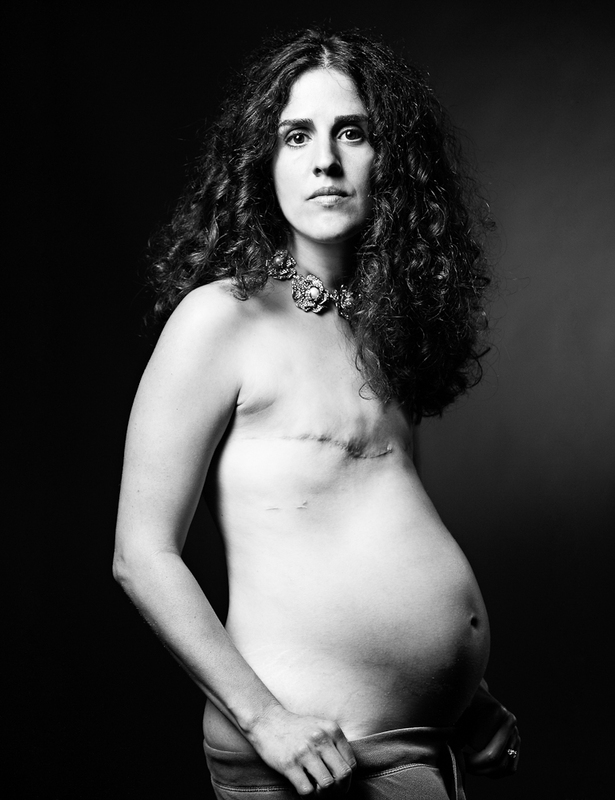 I was on a gallery tour with SCAR Photographer David Jay, and Vanessa Tiemeier and Melissa Adams were both in attendance for the tour, standing beside their SCAR portraits, emanating beauty, courage, and grace. Eager to share their SCAR stories. Ennobled. As their images “transcend the disease, illuminating the scars that unite us all” so do their stories, and their lives, as well. And as I’ve gotten to know the SCAR girls over the past few years, I thought you might like to know some of the noble things these ennobled women are doing, to not just move forward, but to pay it forward. Vanessa, who at 31-years-young has been battling breast cancer since she was 25, has long had a motto of living sincerely. She even has a live sincerely tattoo with a pink peony on her left calf. It’s her trademark “not a pink ribbon”. Shortly after she was diagnosed with a recurrence of metastasis to the brain, she and her sisters founded The Live Sincerely Project to encourage others to LIVE… really live NOW… and not wait till they find out they are dying to start really living. If you haven’t checked it out and taken the Live Sincerely Pledge, it’s not just the best way you can send Vanessa a little love and encouragement, but don’t just do it “For V” Do it for you. That’s what she’d want, anyway, because that’s how she rolls, living sincerely as she goes. SCAR girl Melissa Adams founded Cancer Fighting Princess to help meet the social, emotional, and physical needs of young women throughout their cancer journey. SCAR girl Barbie Ritzco aka Soldier Interrupted aka Marathon Barbie is one of the most kickass inspirational people I know. Besides RUNNING ACROSS THE COUNTRY with Steve Cannon and his coast to coast for cancer million dollar fundraiser for Livestrong this summer, Barbie and her SCAR sister Sara Hamilton have co-founded Flat AND Fabulous, an organization supporting women who are living the “Flat AND Fabulous” lifestyle after having their breasts amputated from confronting breast cancer, rather than, for one reason or another, having gone the reconstruction route. There is a Flat AND Fabulous Awareness group HERE. If you are living the Flat AND Fabulous lifestyle and looking for others who have been there and done that click HERE. On the other end of the spectrum, SCAR girl Cary Goldberg found that after rocking a flat chest for five years, her posture started to suffer and she needed a foundation garment to get her standing straight again. Frustrated by uncomfortable mastectomy bras that constricted the free flow of lymph and were just plain ugly, she was thrilled to discover a women run sports bra company called Handful. Once she tried on their pocketed sports bra, fell in love with it and learned it was already L8000 mastectomy bra approved, she became COO and part owner of the company. Handful is changing their manufacturing to Made in the USA and Cary dreams of making more products that help survivors as their four-woman company grows. Check out this video about Handful HERE. Speaking of fabulous, SCAR girl Sylvia Soo founded Cancerfabulous to chronicle her own experience fighting back with style, to inspire, and as a resource for other young women fighting breast cancer. Sylvia is currently working on a book with Rethink Breast Cancer called, Cancer Fabulous Diaries, which is due out later this year. Her short film, Dear Sister won the Amazing Grace Award at Toronto’s Breast Film Fest last year. Sylvia is also one of the four women (as is Vanessa Tiemier) featured in the EMMY Award winning SCAR Project documentary, Baring It All. Heather Salazar and Diana Featherstone both work with a non profit organization called the Pink Ribbon Girls, whose mission is to provide personalized support to young women throughout all phases of the breast cancer journey, and whose motto is: “No one travels this road alone”. Amber Crouse founded (or rounded up;) the F*CK Cancer Posse. The Knoxville based commuity seeks to reach young cancer survivors and their caregivers/co-survivors so that they do not have to face cancer alone. Jocelyn Banks founded Mommy Has Breast Cancer, an organization whose mission is all about supporting the entire family throughout a diagnosis and treatment of breast cancer. Shay Sharpe’s Pink Wishes organization grants wishes to young women diagnosed with stage IV breast cancer, between the ages of 18-40 and facing a terminal diagnosis from their physician.